Television Critics Association Press Tour, Pasadena, CA, January 19, 2015 – PBS KIDS and SESAME STREET will premiere an all-new one-hour special on February 16, 2015. “The Cookie Thief,” Cookie Monster’s first special, builds on SESAME STREET’s 45-year history of helping children grow smarter, stronger and kinder. The nail-biting, cookie-munching thriller guest stars Rachel Dratch of Saturday Night Live fame and celebrates the arts. “The Cookie Thief” is a fun, action-packed special in which Cookie Monster explores self-regulation concepts – such as impulse control, following directions and managing emotions. New episodes from SESAME STREET will also premiere on PBS KIDS during the week of February 16 (check local listings). 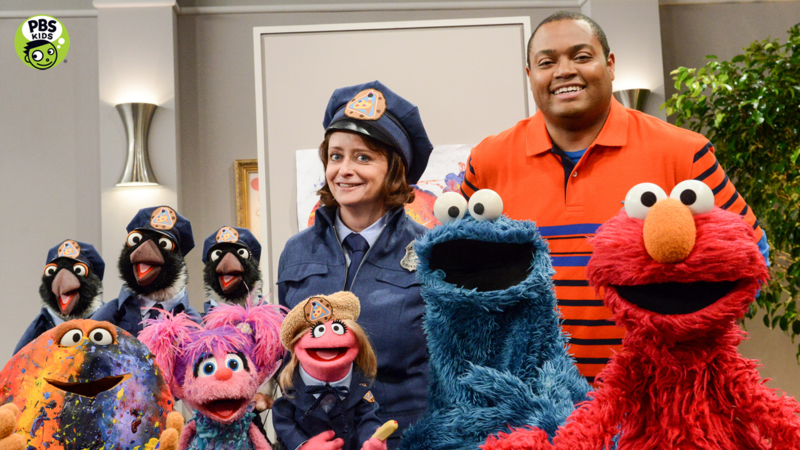 In “The Cookie Thief,” a cookie art museum has just opened on Sesame Street. Surrounded by beautiful cookie paintings, like “Girl With the Cookie Earring” and the “Muncha Lisa,” Cookie Monster and his friends feel as if they’re in a whole new world. But when art suddenly starts to disappear, Cookie Monster quickly becomes a suspect. Can Cookie Monster clear his name? Will they find the missing art in time or will Cookie Monster be banished from the museum forever? On digital platforms, PBS KIDS will also debut new content from SESAME STREET in February. “The Cookie Thief” clips and the full-length special will be available starting February 16 on pbskids.org/video, the PBS KIDS Video App and on PBS KIDS on Apple TV, Chromecast, Amazon Fire and Roku. A new “Cookie Thief”-themed game will also launch on pbskids.org/sesame in early February. Parents can also download Cookie Monster’s Challenge, an app designed for children ages 3-5 that builds on SESAME STREET’s 45th anniversary season’s curricular focus: self-regulation and executive function skills that teachers identify as critical for school readiness. Available on iPad, Kindle and Android tablets, Cookie Monster’s Challenge offers a series of games designed to engage children and challenge them to practice self-control, focus, memory, following directions and problem-solving. Since its debut in 1969, SESAME STREET has provided millions of families with trusted, engaging content, and has earned extensive critical acclaim. More moms watch SESAME STREET than any other preschool program and SESAME STREET has won more Emmy Awards than any other show in TV history. * More information about SESAME STREET is available at www.sesamestreet.org and pbskids.org/sesame. PBS KIDS, the number one educational media brand for kids, offers all children the opportunity to explore new ideas and new worlds through television, digital platforms and community-based programs. Kidscreen- and Webby-award winning pbskids.org provides engaging interactive content, including digital games and streaming video. PBS KIDS also offers mobile apps to help support young children’s learning. The PBS KIDS Video App is available on a variety of mobile devices and on platforms such as Roku, Apple TV, Amazon Fire and Chromecast. For more information on specific PBS KIDS content supporting literacy, science, math and more, visit pbs.org/pressroom, or follow PBS KIDS on Twitter and Facebook. Sesame Workshop is the nonprofit educational organization behind Sesame Street, which reaches 156 million children across more than 150 countries. The Workshop’s mission is to use the educational power of media to help all children reach their highest potential. Delivered through a variety of platforms, including television programs, digital experiences, books and community engagement, its research-based programs are tailored to the needs of the communities and countries they serve, helping children everywhere grow smarter, stronger and kinder. For more information, visit us at www.sesameworkshop.org.